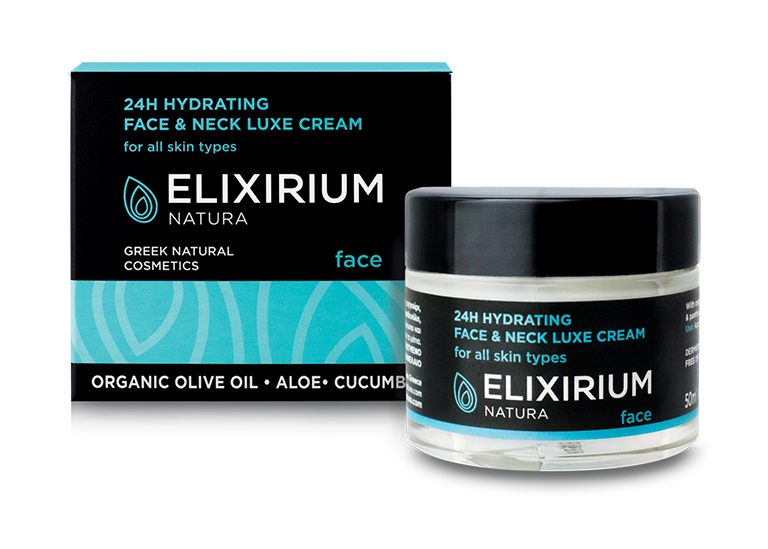 ELIXIRIUM NATURA - 24H HYDRATING FACE AND NECK CREAM. 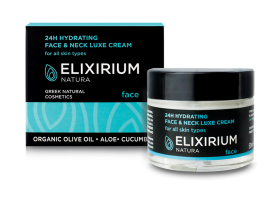 HomeElixirium NaturaFACEELIXIRIUM NATURA - 24H HYDRATING FACE AND NECK CREAM. 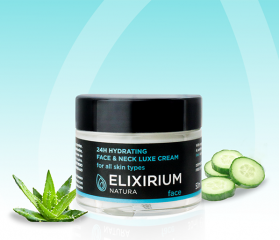 With organic olive oil, aloe vera, cucumber, vitamin E and panthenol. FREE OF PARABENS, PROPYLEN GLYCOL, PARAFFIN OIL. Cream for face and neck rich in organic olive oil, aloe and cucumber extracts. Adding urea and panthenol restores elasticity and leaves the skin renewed and fresh. Use: Apply daily to clean face and neck avoiding the eye area. Ingredients: Aqua, Butylene Glycol, Cetearyl Alcohol, Aloe Barbadensis (Aloe Vera) Leaf Juice, Dicaprylyl Ether, Caprylic/Capric Triglyceride, Isoamyl p-Methoxycinnamate, Olea Europaea (Olive) Fruit Oil, Cyclopentasiloxane, Glyceryl Stearate, Ceteareth-20, Phenoxyethanol, Olivoyl Hydrolyzed Wheat Protein, Ammonium Acryloyldimethyltaurate/VP Copolymer, Caprylyl Glycol, Glyceryl Oleate, Tocopheryl Acetate, Panthenol, Imidazolidinyl Urea, Dimethicone, Glycerin, Cucumis Sativus (Cucumber) Extract, Sodium Hyaluronate, Potassium Hydroxide, Parfum (Fragrance), Eugenol, Benzyl Salicylate, Geraniol, Lilial, Linalool, Citronellol, Hexyl Cinnamal, Limonene, Alpha-Isomethyl Ionone.